What are you doing this weekend? 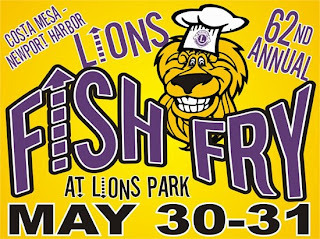 I'm spending part of mine at the 62nd annual Costa Mesa - Newport Harbor Lions Fish Fry at Lions Park in Costa Mesa. This is a wonderful community event, the proceeds from which provide funding for many community organizations under the auspices of the Costa Mesa-Newport Harbor Lions Club. The rides are up and running today and the festivities stretch through Sunday. You'll have a chance to visit with your neighbors, see local politicians cooking up fish and fries and have a great time. 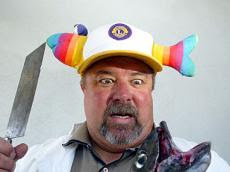 Heck, you might even see Mike Scheafer in his fish fry hat! Come one, come all. Here's a link to the Lions Club web site that will tell you all about it. As some of you may have read in Jim DeBoom's Daily Pilot column, on Friday, May 29th, some of our outstanding friends and neighbors are being honored at the Daily Pilot Community and Clubs Hall of Fame Luncheon at the American Legion Post in Newport Beach. 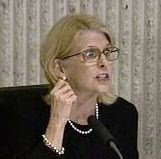 According to DeBoom's column and the invitation provided, the following individuals are being honored: Christina Holiday of the Rotary Club of Newport Beach Sunrise; Richard Freeman of the Exchange Club of Newport Harbor; Carol Van Holt of the Harbor Mesa Lions Club; Mike Scheafer of the Costa Mesa Newport Harbor Lions Club; Fran Ursini of the Costa Mesa Kiwanis Club; Tim Shields of the Rotary Club of Newport Irvine and Jim De Boom himself, of the Rotary Club of Newport Balboa. The event begins at 11:45 a.m. with a reception and noon luncheon. Tickets are available, but time's a wastin' because I didn't post this earlier this week. Here's the link to DeBoom's column with the information. Congrats to all who will receive this very appropriate recognition for their contributions to making our communities such wonderful places to live, work and play. 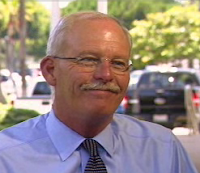 Last week I came across a very interesting interview with Costa Mesa City Manager, Allan Roeder, by writer Debbie L. Sklar in PublicCEO.com. This fascinating interview, in which Roeder addresses many of the current challenges facing our city, may be found HERE. This interview only reinforces my opinion that our city continues to be in good hands and that, with Roeder at the helm, we will find our way out of the current financial turmoil. Just a little note... the city needs to update Roeder's file photo! Is The Parks & Recreation Commission Bigoted? I completely forgot the Costa Mesa Parks & Recreation Commission was meeting today, so immersed myself in what would be a Lakers win. 3 down, 1 to go - Friday in Denver. Anyhow, I remembered the commission was meeting and flipped over t o see what was going on just as they were discussing the agenda item that dealt with the staff's recommendation to permit Aztec Basketball, an organized league of primarily Hispanic players from throughout Orange County, to use the Downtown Recreation Center court on Sundays for seven hours each day for a six month period. Apparently Aztec Basketball is being displaced by facilities in Santa Ana that are being renovated, hence their request to use ours. The owners of the league have gone so far as to acquire a Costa Mesa business license. The proposal would generate nearly $40,000 in additional income for the city. It would also displace drop-in players who currently occasionally use the facility - approximately 22 on average per day. The proposal by the staff seemed well conceived and made some sense. It certainly made better use of our facility and would generate some additional income to the city in these trying times. According to Jana Ransom, Recreation Director for the city, they come highly recommended by previous landlords. Then The Mouth From Mesa North stood to address the issue. During his three minutes he conjured up images of marauding ex-convicts storming into town every Sunday and endangering the children who use our park areas adjacent to the Downtown Recreation Facility. He planted that seed of intolerance that he carries on his hip like a loaded gun and it worked! Yep, at the end of the discussion Chairman Kurt Galitski paused and waited for another commissioner to make a motion - none did. So, treading carefully, he moved to approve the contract with Aztec Basketball as proposed and waited.... and waited.... and waited... for his motion to receive a second. He made the motion again and waited... None of his fellow commissioners seconded his motion, so it died a slow, painful death. I'd like to think that the commissioners actually had good reasons for denying this request, but there was no discussion whatsoever on this issue, so we'll never know. It's easy - and maybe accurate - to assume that The Mouth's presentation had an impact on the other four members of the commission - that it pulled off the scab of intolerance and caused the commissioners to show their true colors by their silence. I returned home from the long Memorial Day holiday, having celebrated my 50th high school reunion with a bunch of old people (more on that later), and spent part of the day Tuesday plowing through accumulated emails. Among the other things I did was check some of the local blogs, to see what they thought was important during my four-day absence. Today I found this entry in the Red County/OC Blog, authored by Matt Cunningham, which announced the very first fund raiser for our young jailer(or is he? 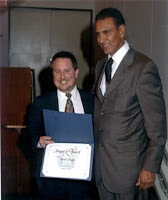 )mayor, Allan Mansoor in his bid for Van Tran's seat in the California Assembly. You can view the invitation by clicking on the link in that article to see the players involved. As some might expect, this was a real test of my gag reflex, and became even more so as I read down the list of members of the Host Committee and Honorary Co-Hosts. Among the former are two of Mansoor's appointees - Planning Commission Chairman Jim Righeimer and his pal, Commissioner Steve Mensinger. Another familiar name on the Host Committee list was local businessman Surat Singh. You may recall the dust-up about campaign finances between Singh and Monahan earlier this year. In the latter category we find mostly politician's names, including Mansoor's barnacle in his last election, Mayor Pro Tem Wendy Leece, Councilman Gary Monahan and a couple more of their appointees - Planning Commissioner Colin McCarthy and Parks & Recreation Commissioner Jeff Matthews, who was Monahan's campaign manager. For a hundred bucks a head you, too, can help fill Mansoor's campaign piggy bank so he can take his "prodigious intellect and razor-like wit" (he says, tongue in cheek) off to Sacramento. I'd send them a check if I thought it would get Mansoor out of town where he couldn't continue to screw up our city. This promises to be one very interesting race, as mentioned in Cunningham's post on the Red County blog. Mansoor is going to have to go against some very well-connected and financed Republicans from the Vietnamese community - not an easy task. Back to my reunion. The four-day event was a rousing success, with activities planned throughout the weekend. Fortunately, we all wore name tags with our high school photographs on them - otherwise we'd have spent much of those four days bouncing off each other without a clue of our identities. It was held in Pasadena, not too far from where I grew up. There are no hotels in the part of the northeast Los Angeles barrio where I spent my youth. There were trips to museums, Gold Line rides to downtown with lunch at Filippi's and a little walk through Olvera Street. Some of my classmates drove over to the original Bob's Big Boy restaurant in Burbank to let their taste buds enjoy a trip down Memory Lane, too. There was even a tour of our old school, although it has been completely rebuilt since we attended. I've recently joked to some that the 50th reunion is the one where you show up to see who's still vertical. Well, that was pretty funny until this event actually arrived. While it was fun to see many old friends, it was very sad to read down the list of those who have passed on and realize that, before the next reunion, many of these friends we were sharing fond memories with would not be around for that event. I've known some of the attendees since kindergarten. Some seem not to have changed a bit since the day we graduated, while others seem like complete strangers - at least appearance-wise. Some of the guys who were star athletes look like they could still measure up today. Others, like your humble correspondent, seem to be built more for comfort than speed these days. Some of the lovely ladies of my youth remain beautiful women to this day. Others look every bit like the grandmothers they are - having dealt with the tribulations of life for a half century since I last saw them. Regardless, everyone had a great time. There were no frowns, only four days and nights of perpetual joy and fellowship. Lots of guys huddled together, sharing stories punctuated by roaring guffaws. Small groups of women smiling and jabbering - seeming all at one time - with the occasional high-pitched giggle at a punchline. There were formal and informal memory tests to re-connect those synapses that seem to have short-circuited a little in recent years. Go ahead - you try to remember the name of your senior class vice president! Can you name the homecoming queen and her court? What was the name of that favorite ice cream store? There was a series of long tables stretching almost the length of the room on which memorabilia from bygone years was placed for viewing and fondling. Bound copies of our award-winning high school newspaper provided us with memory-joggers and many smiles. Copies of old yearbooks made us chuckle as we flipped the pages full of familiar faces from a half-century ago. The DJ played some great tunes of our era. Numbers like "Duke of Earl" by Gene Chandler, "Come Softly To Me" by The Fleetwoods and everyone's "our song", "The Theme From A Summer Place" by Henry Mancini. It was fun to watch as many of my classmates re-lived their youth by doing the Bunny Hop, The Stroll and The Chicken Dance. That old saw about the spirit being willing but the body is not sure came into play. And, it showed once again that not all God's children have rhythm. It was fun to see my prom date again after all these years, and to recall those magic moments with the couple with whom we double-dated that evening. They've been married for nearly 50 years. In fact, an amazing number of couples from my class who married within a few months of graduation are still happily together after all these years. This weekend only reinforced for me the value of friends - new and old. I'm grateful for having had the chance to tell a few of my old friends how much our relationships way back then have meant to me. Some have remained strong to this day, while others kind of faded away, only to be re-kindled this weekend. And, it makes you realize and appreciate the fragility of life itself. It's painful when I sit and talk to a former football star who, today, is dealing with the early stages of Parkinson's Disease, or when I chat with a former vivacious and perky cheerleader who has developed a tremor in one arm. It's tough to sit and visit with a former drill team member who has had both knees and one hip replaced and is dealing with a lot of pain - but still with a great smile on her face. And through all this there was the joy of re-acquaintance - of hearing the stories of kids, grandkids and great grandkids - and of careers successfully played out to the point of retirement. It was inspirational to hear the stories of friends who now trek to far off lands to volunteer their professional services to undeveloped countries instead of playing 5 rounds of golf a week.